Created in 1998 by garden designer Arthur Shackleton, Fruitlawn Garden covers approx 1 acre within a walled in setting. The garden has a formal layout with paths, hedges and a hornbeam tunnel dividing it across the middle. The different spaces in the garden include large perennial borders which have a mass of changing colour and texture throughout the summer. There is also an Oak copse, under-planted with lots of spring bulbs, a fruit and vegetable garden area, which includes more unusual plants like sea-kale, asparagus, blue potatoes and wineberries. A small orchard is set in a wildflower meadow. A small formal pool, a yew-hedged recreation space and many unusual and beautiful wall plants complete the picture. 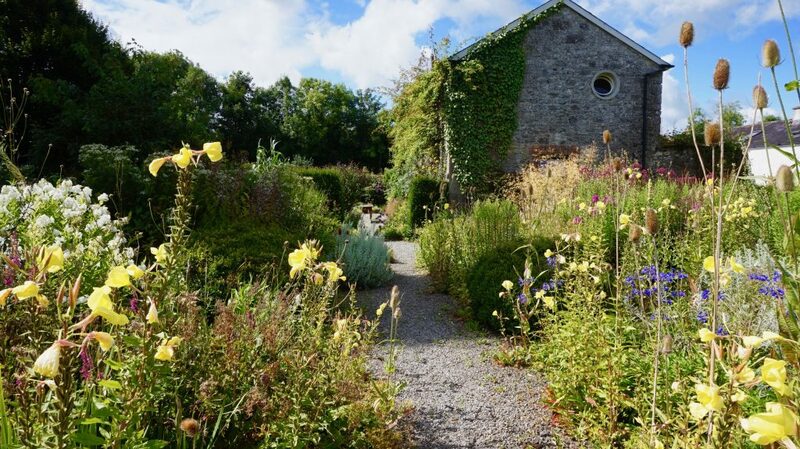 The plants in the garden include many rare and special varieties collected over the years from some of Ireland’s best gardens. Many of these are for sale in the garden. Within the formal layout, hundreds of perennial plants self-seed freely giving the garden a relaxed and informal feel. These include: Agapanthus, Aquilegas, Campanulas, Geraniums, Oenotheras and Eryngiums. Admission Fees: €5 per person without guide. €7 for guided group tours. No group discount. Guided tours for groups only.